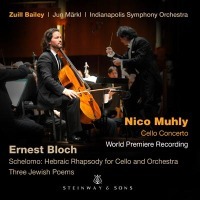 The Hebraic Rhapsody for cello and orchestra Schelomo ("Solomon") is the best-known work of Ernst Bloch's "Jewish Cycle." It was composed in the space of two months, between December 1915 and February 1916, and dedicated to the Russian cellist Alexander Barjansky. The Carnegie Hall premiere, by the New York Philharmonic under Artur Bodanzky, with the orchestra's principal cellist Hans Kindler taking the solo role, occurred during a concert including the entire Jewish Cycle. Bloch himself is known to have directed the work only once, when Barjansky performed Schelomo at the Rome Augusteo in 1933. In his program notes, Bloch explained "for years I've had sketches for the book of Ecclesiastes that I wanted to put into music...if you will, the cello can be imagined to be the reincarnated voice of King Solomon, while the orchestra's more complex voice belongs to his time, his world...to his experience. The cello represents a meditative voice, tragically alone." Although in free rhapsodic form, Schelomo can be subdivided into three sections, preceded by the cello's opening soliloquy. The work begins with Solomon's lamentation ("vanity...all is vanity.") before we hear a succession of languorous slow dances and luminous reflective figures (the celesta takes a very important part here) punctuated by occasional outbursts of anger from the brass, paraphrasing motifs from the Hebrew Shofar. In each of these, Solomon abandons himself to the seductive and voluptuous atmosphere, while the dense counterpoint evokes a near Tower of Babel of tortured complexity, before a gigantic climax is reached. Now, Solomon's initial protestations of disgust return, as oboe and bassoon solos invoke the synagogue chant "Asher kidshonu." At first, the cello resists the cantor's voice, but then becomes progressively intertwined with its texture as the mounting liturgical chant approaches a second major climax. In the concluding episode, again the mood is one of bitter despair and resignation, though a fleeting heavenly vision interposes, only to be denied in another frenetic orchestral outburst, which soon disintegrates, leaving the lone and desolate voice of the cello reflecting again on Solomon's conviction that "all is vanity." Schelomo ends in a mood of dark, unmitigated pessimism, darker, surely, than even its opening utterances would have intimated. Bloch added "this is my only work that culminates in a total negation -- but the subject demanded it."